“Maybe we shouldn’t even call it a browser anymore,” Mozilla’s VP of Firefox engineering Jonathan Nightingale told me a few days ago. “‘Browser’ is really an antiquated word. People don’t really browse all that much anymore.” Instead, he argues, we now mostly use our browsers to access sophisticated web apps, web-based productivity tools and social networks. For browser developers, this means they have to start to rethink what their browsers should look like now that usage patterns have changed and that the majority of users have become pretty experienced Internet (and browser) users. The project that has been guiding Mozilla’s exploration of what a modern browser should look like is Australis (because Mozilla apparently likes to name projects after star systems) and the fruits of this project will soon find their way into the Firefox release channels, starting with Nightly once it hits version 25 soon. After that, it will make its way through the usual release channels, though Nightingale told me that the team may hold it back from the stable channel a bit longer to ensure that everything works smoothly. 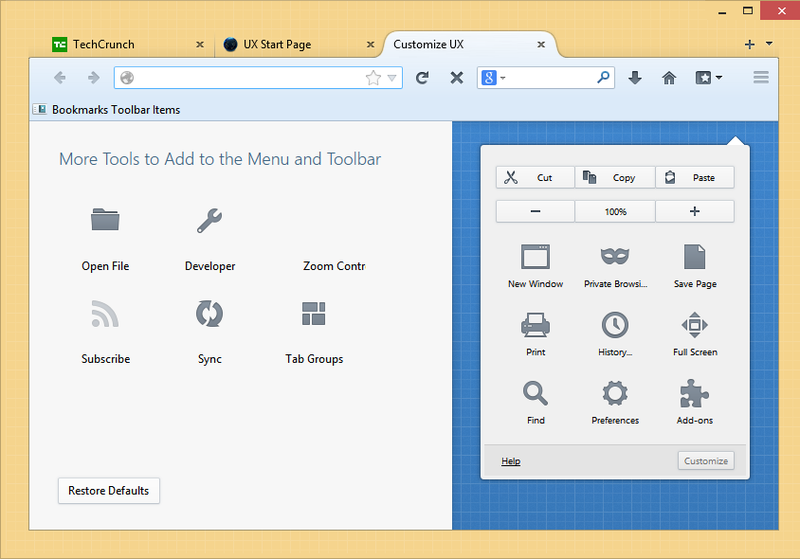 If you feel really adventurous, you can already install a version of Firefox from Mozilla’s relatively obscure UX branch and test it in its current state (but don’t blame us if it crashes a lot or shreds your hard drive). So what’s Australis all about? 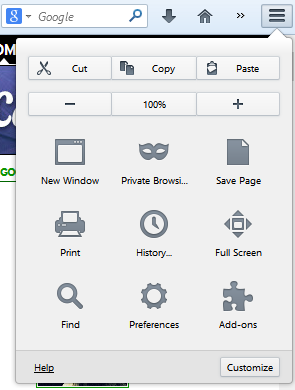 At first glance, it looks a bit more like Chrome than the Firefox we know today. In its current iteration, the Australis theme features rounded corners for tabs and the same three-bar icon to the right of the URL and search boxes to bring up a drop-down customization and settings menu. As Nightingale told me, the idea behind Australis was to design a browser that was just as capable as today, but simpler to use. The team was also tasked to look closely at how people actually use their browsers and then design the user experience around this. The new design, he believes, is cleaner and more intuitive. One example he cited is that in the current iteration of the design, unselected tabs basically blend into the background and don’t even have the usual tab borders around them. Instead of just shrinking tabs as you open more of them, even though you can’t even see the individual tabs’ icons anymore (the way Chrome does), the Firefox team has also decided to set a minimum width for tabs and then move to a scrolling tab bar once the maximum number of tabs has been reached. While the main Australis theme won’t land in the stable channel before October, Nightingale did stress that even today’s version of Firefox was already influenced by the results of the project. The combined stop/load/reload button in Firefox, for example, came out of this group. So did the new download manager and the fact that Firefox now doesn’t show the forward button anymore when there is no page to go forward to. The customization and tools menu now also uses icons in a three-by-three arrangement and dedicated buttons for copy, select and paste, as well as for increasing font sizes instead of just using a regular drop-down text menu. Australis is not just about the design, though. 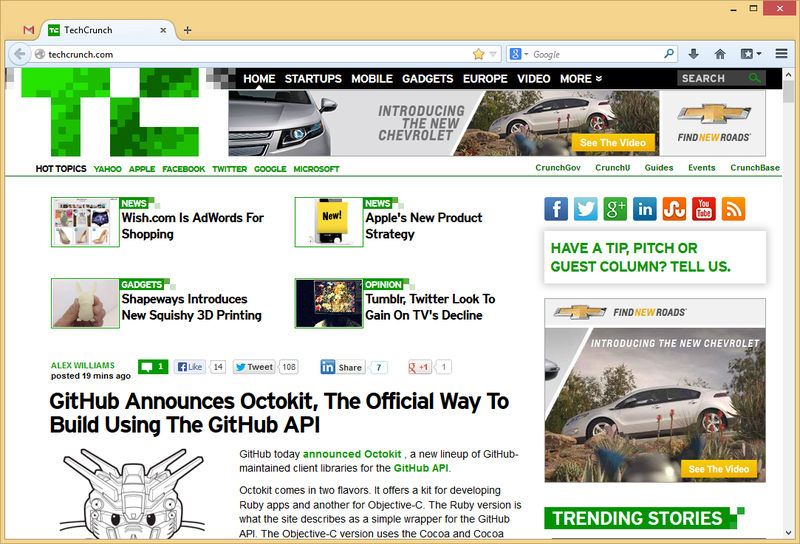 One area that’s also changing with Australis is how you customize the look and feel of your browser. Mozilla currently offers quite a few tools for this, but the team believes they are hard to find and not “fun” enough to use. As Mozilla’s Gavin Sharp told me, the idea here was to get users to enjoy customizing their browsers for the way they use it. Unless users can find these features, though, they could just as well be left out, so the team is working on ways to make it a bit more obvious that users can rearrange and remove virtually all the parts of the Firefox interface to suit their needs. Now that Firefox is on a rapid-release schedule, the team obviously can’t change the user interface with every update, so the current thinking is to roll some things out together once they are ready and, where it makes sense, roll others out individually. This means that while we’ll see Australis and its curvy tabs in the nightlies of Firefox 25 very soon, it may not actually land in the stable version of Firefox 25. Building the browser of the future, of course, is not just about design. Mozilla is also trying to adjust to how its users now use their browser through tools like its Social API, as well as more perfomance-oriented initiatives like OdinMonkey and asm.js. Still, the first thing users will notice once Australis rolls out is the new design. It’ll be hard not to look at it and think that it looks a bit like Chrome – and that will surely stir up a bit of controversy.